Mix Veg Recipe | Mixed Vegetable Curry | Cook Click N Devour!!! This mix veg recipe is absolutely delicious, easy to make and oh so versatile. Just a big batch of this curry and you are good with side dish for roti or rice. 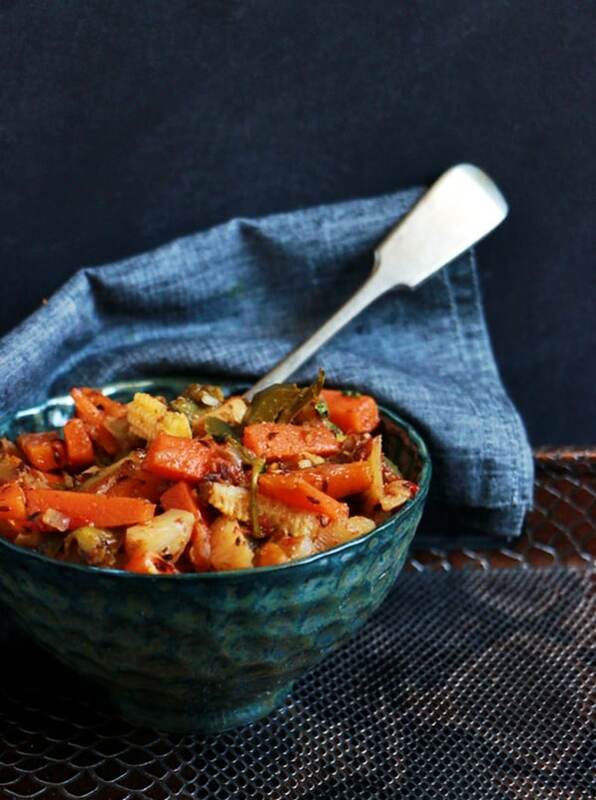 Also it takes just 30 minutes for you to whip up this mixed vegetable curry! Mix veg Recipe For The Win! It is fast– Yup, you can make this mix veg recipe in 30 minutes flat and that includes the time taken for chopping the veggies! No grind- Unlike many recipes you will find online,my recipe for mix veg involves no grinding. just chop, saute and stir! So easy! Chock full of veggies– this is my favorite part about this curry. It has a chockablock of vegetables and all presented deliciously! Which Vegetables Are Best in This Curry? To make veg curry recipe, I have used potatoes,carrots, bell peppers and baby corns. You can add sweet corn, sweet pumpkin, cauliflower, broccoli too. Avoid vegetables like okra, eggplant in this veg curry recipe. This is a semi dry veg curry, vegetables are cooked well with just enough water, so this is a very healthy one too. How To Make Mix Veg Recipe Easily? Making this recipe can’t be simpler. Just peel and cut the veggies into cubes or batons. If you are using cauliflower separate into size size florets. Heat oil in a pan and temper with cumin seeds. Next saute the whole spices until fragrant. Add the chopped onions and saute till they turn soft. Add chopped tomatoes, ginger garlic and chilies. Cook till the tomatoes turn soft.Add the veggies, seasoning and mix well. Cook in medium flame till the vegetable get cooked and turn tender. Serve hot! Mix veg recipe can be made in many ways. I usually keep changing the seasoning and ingredients to bring some variation in flavor and taste. You can add a ground paste of cashews, onions and tomatoes to make a rich veg curry that goes well with butter naan. Also you can make south Indian style curry with ground coconut-cumin paste similar to avial. Instead of using whole spices you can just add garam maslaa powder and chili powder. This is a quick veg curry especially perfect for rushed weekday mornings. Finally you can add mushrooms, paneer or soya chunks to add some texture to this curry. How To Serve Mixed Vegetable Curry? Filling for veg sandwich– Place a generous portion of curry between two slices of bread and toast with butter! Use as filling for wraps, fajitas– This mix veg recipe goes as perfect filling for wraps, fajitas and also tacos. Have some leftover rice? Just mix this veg curry, add a dollop of ghee and there you instant and easy veg rice. Use fresh, tender and seasonal veggies for making this curry. For more flavor you can saute the spices in ghee or butter. The vegetables should get cooked yet retain the color, shape and crunch. Do not over cook the vegetables. 1. Chop all the vegetables into equal sized cubes or fingers. Finely chop onions and chop the tomatoes. 2. Heat 1 tablespoon oil in a kadai. Add cumin seeds and let it splutter. Next add cloves, cinnamon stick and black cardamom. Saute for 2-3 minutes. Also add crushed ginger-garlic and saute well. 3. Now add green chilies, red chilies and saute well for few minutes. Next add finely chopped onions and saute well till the color changes slightly. 4. Then add chopped tomatoes and cook for 5-6 minutes until the tomatoes turn mushy. Add chopped coriander leaves and cook for 3-4 minutes. 5. Now add the chopped vegetables and mix well. Season with salt, chili powder and coriander powder. Mix well and saute for few minutes. 6. Also add about 3/4 cup water and cover and cook for 10-12 minutes. Open and check if the veggies are cooked well, else add some 1/4 cup water and cook. 7. Once done, mix well and serve veg curry with rice/roti. veg curry recipe with mixed vegetables, easy no grind veg curry with simple ingredients! Chop all the vegetables into equal sized cubes or fingers. Finely chop onions and chop the tomatoes. Heat 1 tablespoon oil in a kadai. Add cumin seeds and let it splutter. Add cloves, cinnamon stick and black cardamom. Saute for 2-3 minutes. Add crushed ginger-garlic and saute well. Add green chilies, red chilies and saute well for few minutes. 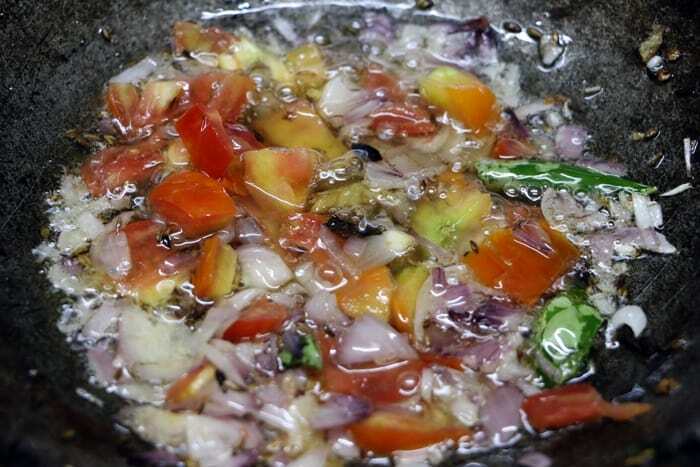 Add finely chopped onions and saute well till the color changes slightly. Add chopped tomatoes and cook for 5-6 minutes until the tomatoes turn mushy. Add chopped coriander leaves and cook for 3-4 minutes. Add the chopped vegetables and mix well. Add salt, chili powder and coriander powder. Mix well and saute for few minutes. Add about 3/4 cup water and cover and cook for 10-12 minutes. Open and check if the veggies are cooked well, else add some 1/4 cup water and cook. Once done, mix well and serve veg curry with rice/roti. 2. You can cook the veggies in some coconut milk if you wish along with water. Awesome color and looks perfect! I made this curry today and it turned out so yummy with rotis. Thank you!